We’re almost clear of this rough Michigan winter weather with spring being right around the corner. These weather patterns have been less than forgiving to local homeowners though. We saw a spike in wind damage this winter and that means one thing: Winter Roof Damage That’ll Need Repairing. Thankfully we here at Eastbrook Construction are here to help. We can help inspect your roof and repair any winter storm damage it may have gotten over this past season. Winter storms don’t have to cost you an arm and a leg. Get your roof inspected today! With strong storms and high winds we’ve been having, you need to be sure your roof hasn’t sustained damage. Roof damage from winter storms is very common, and sometimes you don’t notice until it’s too late. Mysterious leaks, shingles around your home, and weird smells from mildew growth are just a few signs something may be wrong. Winter weather roof damage is a problem that needs to be addressed sooner rather than later. Putting off getting your roof checked out or repaired after a winter storm will only make things worse. 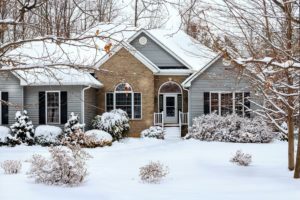 What with Spring still a little off the chances of another strong storm or frost is very possible and you don’t want your home taking more damage. The thawing and freezing loop will exacerbate any damage and most likely cause more damage to your home. Being proactive now will save you further down the line. So don’t let any winter storm damage go unchecked. Hire a professional roofing company like Eastbrook Construction and get your roof fixed correctly the first time. We’ll even give you a free quote on your next roof inspection and repair. So why wait? Get your quote today! This entry was posted in Roof Inspections, Roofing Company and tagged damaged roof, local roofing company, repairing tree damage, winter roof damage, winter storm, winter storm damage. Bookmark the permalink. ← Need a New Roof? Budget Your Tax Return!